Father Kevin Mulligan (center), pastor of St. Genevieve Parish in Flourtown, posing with students of St. Genevieve and St. Joseph Sister Theresa Maugle, gets ready to go to Minnesota to watch the Philadelphia Eagles play in Super Bowl LII on Sunday, Feb. 4. When Father John Babowitch received notice that he was definitively going to attend Sunday’s Super Bowl between the Philadelphia Eagles and New England Patriots in Minnesota, he was excited. Well, more like very excited. Actually, he was thrilled. OK, he was beyond thrilled. Few, if any, bleed more green than Father Babowitch. Father John Babowitch, pastor of Our Lady of Calvary Parish, Philadelphia, and perhaps the area’s biggest Eagles’ fan. Long story short, Father Kevin Mulligan, pastor at Flourtown’s St. Genevieve Parish, was gifted two tickets by a benefactor of Pope St. John XXIII Seminary in Weston, Massachusetts, where he studied before his ordination for the Philadelphia Archdiocese in 2015. Father Mulligan’s comrade of choice was a no-brainer. When it comes to being a sports expert, Father Mulligan is no slouch himself. A 1973 graduate of since-closed Bishop Kenrick High School in Norristown who grew up in St. Helena Parish in Blue Bell, Father Mulligan conducted a long, successful career as a sportswriter. While at the Philadelphia Daily News from 1982 through 2005, Father Mulligan eventually became the Eagles beat writer. He attended “five or six” Super Bowls, he recalls. Ultimately, Father Mulligan departed journalism for ministry. This Eagles Patriots connection with the two men has happened before. While a seminarian in New England, Father Mulligan once had a pair of tickets to an Eagles-Patriots game that started at 4:15 p.m. Sunday afternoon. If Father Babowitch wanted to attend, he was invited. Undaunted, Father Babowitch immediately accepted the offer. He drove six hours north, watched the Eagles shock the Patriots, and then immediately drove home through the night because he had a 6:30 a.m. Monday Mass to celebrate. Father Babowitch is a product of Visitation B.V.M. Parish in Philadelphia’s Kensington section and the since-closed North Catholic High School (Class of 1987). 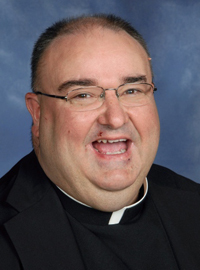 He was ordained in 1996 after studying at St. Charles Borromeo Seminary. He has thoroughly reveled in the “happy” moods of Philadelphians since this amazing Eagles’ ride started gaining steam during the regular season and reached incalculable decibels during a surreal 38-7 win over the Minnesota Vikings in the NFC championship two weeks ago. “I’m a Philly boy through and through,” Father Babowitch said. “The entire city is just so excited for this. You see it everywhere you go, people wearing Eagles’ shirts. You hear it on the radio. They love all their sports, but this is an Eagles’ town. Always a faithful Philadelphian, Father Mulligan stopped being an Eagles’ fan per se early in his sports writing career, which is common when a person’s employment is tied to an organization that you watch day in and day out on a professional level. This year’s edition of the Eagles, however, has inspired him. He will definitely be cheering for the Eagles to dethrone the perennial-champion Patriots inside Minnesota’s domed U.S. Bank Stadium. He and Father Babowitch will fly out Saturday to Chicago, drive to Minnesota and stay overnight at a seminary in the Minneapolis/St. Paul Archdiocese. Father Mulligan said sports teams have the capacity to create peace, mend disagreements and galvanize communities. He has talked about this with the St. Genevieve parishioners and student body. “The unifying power of this is great,” he said. “We can learn so much from athletes in team settings. They start as strangers … draft picks … free agents. Then they become brothers. In the parish bulletin this week, Father Mulligan predicts the Birds will declaw the Pats, 24-21. A few miles away, Father Babowitch is portending a 24-17 Eagles victory. If the Eagles triumph, Father Mulligan will be St. Gen’s most popular person because he promised the school a “pastor’s holiday” to commemorate what would literally be a historical event. Father Babowitch did one better, asking the school what day they would appreciate having off regardless of a victory. They chose Monday. With more than a million fans desirous of attending a parade on Tuesday or Wednesday, maybe the archdiocese will follow suit and declare a celebratory respite for its workers. Father Babowitch would undoubtedly attend that parade, same as Father Mulligan. To anyone who wants to listen, they would have quite a story to tell. A story that supersedes winning or losing. A story that defies logic. Father John Babowitch (second from right) stands with students and staff of Our Lady of Calvary Parish in Northeast Philadelphia, enjoying a moment he and a million other residents have waited a long time to witness: the Philadelphia Eagles are aiming to win their first Super Bowl on Sunday, Feb. 4. I worked with Father Mulligan when he was a sports writer at the now defunct Philadelphia Journal. The Philadelphia Bulletin did all the Journal’s composing room work and printed their newspaper. He was a good guy to work with never used a curse word, always professional. Someone gave him the nick name of “Muggs”. I guess now it is Father Muggs. Wishing the players and fans a jolly good time. God bless. Couldn’t be more happy for you, Father John! Have a wonderful experience and be safe. Fly Eagles Fly! So happy for you Father. Great article… Wish them well… I stopped watching the NFL over the kneeling controversy and haven’t missed the $$$cry babies since….